Ritu Kamal is the Director of Product Management at CellMax Life, an early stage startup commercializing novel cancer blood tests in Asia. She has previously worked at Roche Diagnostics as a Scientist. She was a 2010 Stanford India Biodesign Fellow, where she worked on developing new medical devices for better maternal and neonatal health. She has been a Princeton-in-Africa Fellow, working in South Africa on prevention of HIV/AIDS from mothers to new-born children. 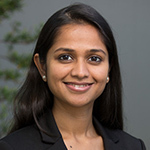 Ritu is also the Assistant Director (US) for the Singapore Stanford Biodesign program. She is also part of the Stanford Biodesign faculty team supporting the new Japan Biodesign program. She has a bachelors from Princeton University, MS from University of Pennsylvania and is working on an MBA from UC Berkeley.